Welcome to the Meet Neon Cop page. One of the very first characters I wrote about was the Neon Cop. He fought crime in his fluorescent coloured shorts, top and sunglasses. In the first book I wrote, he finds a little girl at the beach. The little girl’s name was Jenny. Jenny’s mother had left her on the beach and the Neon Cop took it upon himself to solve the mystery of what happened to her. My father loved my Neon Cop stories but, he always referred to the Neon Cop as RoboCop. If you asked him right to this day, he would still say RoboCop. My only wish is that my Neon Cop stories were as famous as RoboCop, but maybe someday they will be. 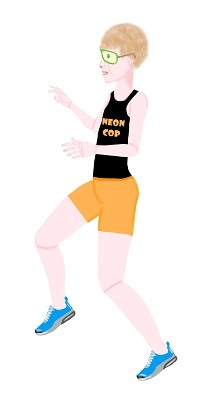 This entry was posted in Meet the Characters, Neon Cop Stories and tagged Neon Cop, wish. Bookmark the permalink.